Opportunistic con man Dan Kehoe ingratiates himself with the cantankerous mother of four outlaws and their beautiful widows in order to find their hidden gold. Two brothers discharged from the Confederate Army join a businessman for a cattle drive from Texas to Montana where they run into raiding Jayhawkers, angry Sioux, rough terrain and bad weather. Amantha Starr grows up as a privileged southern Belle in the ante-bellum South, but after her father dies broke, her world is destroyed when she discovers her mother was black. Dark, romantic, complicated drama about a rowdy merchant mariner and sophisticated librarian who clash over their lifestyles and values - and then fall in love. Two English aristocrats pursue a rich American widow who may not be quite the person she claims to be. The story of William "Buffalo Bill" Cody, legendary westerner, from his days as an army scout to his later activities as owner of a Wild West show. The arrival in Las Vegas of a businessman and his glamorous wife creates a complex web of murder and deceit. A group of disparate travelers are caught and thrown together in a posh Alpine hotel when the borders are closed at the beginning of World War II. In 1871 a convict escapes, with other prisoners, to kill the man that framed him, but has second thoughts after meeting the man's beautiful future wife. Middle-aged bride Ann Hamilton soon begins to suspect that her charming husband is really a psychotic who plans to murder her. 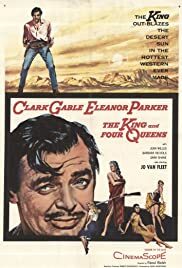 After inadvertently stopping an Indian attack on his stagecoach while traveling in the American West, an English gentleman finds himself appointed sheriff of a nearby town. A submarine lieutenant and his commander fall in love with the same girl. Josiah Sweet, Undertaker: Hey, how'd you like to ride over to Wagon Mount with me and make $2? Dan Kehoe: I've already got $2, thanks all the same. 17 of 24 people found this review helpful. Was this review helpful to you?